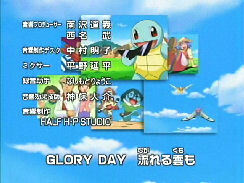 About ten episodes after Glory Day made its debut, the lyrics were rewritten. Here are the lyrics for this second version of Glory Day. To see the various animation updates made for the ending theme, click here. Used in episodes AG #110-?? ?